At American Skin Institute’s Westlake Village, Beverly Hills, and Sherman Oaks offices, we’ve worked with many patients who are dealing with acne, and have helped many of them achieve clear skin. However, as problematic as breakouts and pimples can be, one issue that we see on a regular basis is the skin damage from improper acne extraction at home. Too many people become so frustrated with their breakouts that they start trying to squeeze out pimples, only to cause more damage. Unfortunately, the skin damage from this can be very serious, and can include bacterial infections, visible acne scars, and increased inflammation. There are many reasons for this; including improperly applying pressure to the pimple, trying to extract acne that is too deep, and failing to recognize the direction of the pore. First, let’s take a look at what types of acne can be extracted safely, as not all pimples can be treated in this manner. Here at American Skin Institute we tend to focus on extracting blackheads and whiteheads. In the case of these pimples, we open up the pore that contains the pimple, and extract the sebum, oils and other debris (the ‘comedone’) to cleanse the pore. In some cases, we can also extract pimples that have become inflamed and have turned into pustules. This is something that should never be attempted at home, but at our office we have a number of tools that can help make even the extraction of pustules safe for the patient. Of course, if our skin care experts believe the extraction of a particular area is too dangerous, we will help you explore other options (like laser acne treatments) for that particular site. Lastly, keep in mind that cystic acne is rarely treated with extraction, as the clogging is too deep in the skin to perform this procedure without causing undue damage to the skin. This type of acne may be more effectively addressed with laser treatments, antibiotics and oral retinoids. Submit Contact Form for Acne Extraction Consultation! Our skin professionals take a great deal of care when performing acne extractions; to reduce chances of scarring and skin damage. Here are some of the major aspects of how we perform this procedure. Sterile tools: We use only sterile tools when performing extractions, because this significantly minimizes risk of bringing bacteria into the pore and creating infection. Opening the pore: Some pimples require the opening of the pore before the actual extraction, because if the pore is too narrow the force of the sebum/debris/oils can cause undue tearing and bruising of the skin. By creating a clear pathway for the comedone in troublesome pimples, we significantly minimize potential skin damage. Applying pressure correctly: Applying pressure to the right area is a huge part of performing acne extraction properly. To do this correctly, we identify the direction of the pore (pores are not always perpendicular to the surface, but are usually at an angle). Unfortunately, many individuals who perform at-home extractions on their skin don’t realize the damage they are doing precisely because they don’t account for the direction of the pore, or can’t see it in the mirror. So they apply too much pressure and at the wrong place, and cause excessive skin damage. 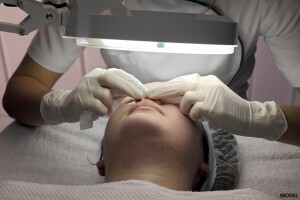 Identifying pore clusters: When performing acne extraction, it’s vital to correctly identify clusters of pores that are inter-connected in order to effectively apply pressure. Such clusters occur when the pores become connected under the skin, and can be especially troublesome for patients because the collective bacteria and debris under the skin can significantly extend regular healing times. Our skin care professionals are experts at effectively identifying and extracting such acne clusters with minimal skin bruising. Specialized devices: To help with the extraction process, our skin care experts have access to a variety of devices, including suctioning tools that can help loosen debris and sebum inside pores. Some people try to perform acne extraction themselves and look for various ways to get rid of their whiteheads and blackheads manually. You may have even found acne extraction tools sold online that claim to be exactly the same as those used at a dermatologist’s office. But there’s a big problem with at-home acne extraction; it’s not enough to just find the tools…you also need to be able to use them safely (after all, you could also find a dentist’s drill online, but that doesn’t mean you can safely do your own fillings). To avoid skin damage, you need to know how to apply pressure correctly, how to assess the direction of the pore, how to deal with pore clusters, which pimples won’t respond to acne extraction and much more. Your skin is very delicate, and even if you have professional tools at your disposal, it’s very easy to damage your skin and cause scarring if you don’t have experience with this procedure. Don’t take chances with your skin, let our expertly-trained skin care professionals treat your acne safely. We’ve performed thousands of acne extractions and have direct expertise in extraction techniques that reduce skin damage, and reduce chances of bruising and scarring. Just call the American Skin Institute practice in Westlake Village, Beverly Hills, or Sherman Oaks, or just fill out the Contact Form below to set up a consultation!